A mole -- abbreviated as mol in calculations -- is a unit of chemistry used to represent a small mass of any type of particle from atom to molecule. One mole of any particle is equivalent to its atomic weight, reported as u or grams per mole, as represented on the periodic table. 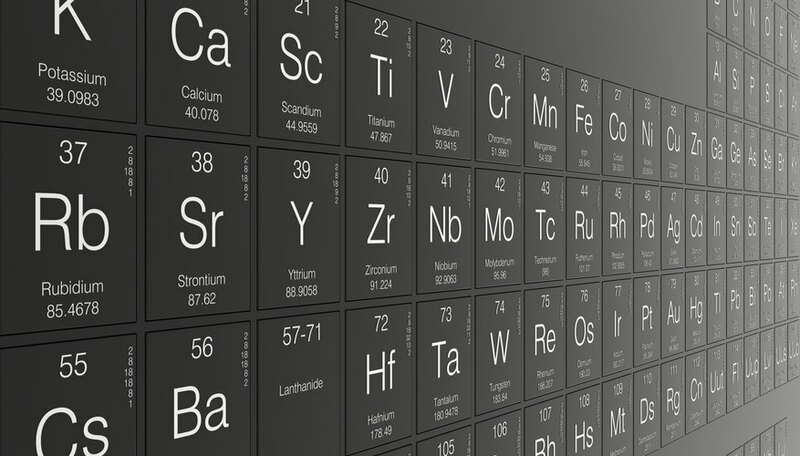 The periodic table is an efficient chart that relays essential information about 109 chemical elements. Each element is ordered by increasing atomic number, which is reflected in the whole number digit in the upper left or center of each tile. Below this atomic number is the letter symbol or abbreviation for each element. Under this symbol is the corresponding atomic weight, which is the value you will need to convert grams to moles. Given an initial value of 10.65 grams of sulfur, symbolized as S, you can read the periodic table to determine that the atomic weight for that element is 32.065 u, or 32.065 grams per mole, which is generally abbreviated 32.065 g/mol. You can then convert the number of grams to moles by multiplying your original value of 10.65 grams by 1 mole over 32.065 g/mol, which will result in 0.332 mole sulfur. J., Teresa. "How to Convert Grams to Moles." Sciencing, https://sciencing.com/convert-grams-moles-4676277.html. 24 April 2017.